SKU: 8265-S. Categories: Automotive, Brick, Ceramic, Concrete, Epoxy Adhesives, Fiberglass, Metal. J-B Weld is The Original Cold Weld two-part epoxy system that provides strong, lasting repairs to metal and multiple surfaces. Mixed at a ratio of 1:1, it forms a permanent bond and can be shaped, tapped, filed, sanded and drilled after curing. 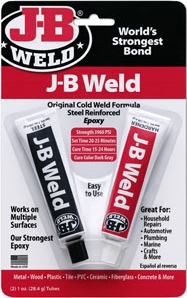 At room temperature, J-B Weld sets in 20-25 minutes to a dark grey color. A full cure is reached in 15-24 hours. J-B Weld has a tensile strength of 3960 PSI and sets to a hard bond overnight. It can withstand temperatures up to 550ºF when fully cured. Dry: Sets in 20-25 minutes. Cures in 15-24 hours. Allow 4-6 hours before handling and 15 hours (min.) before putting object back in use.